The month of June/july,we’ll, june,july,August Still 2nd week of September is rainy season in Nepal & off course it is not perfect time to see mountain sceneries in Annapurna base camp,langtang & Everest so Trekking in upper mustang, would a great ideas as upper mustang is rain shadow area & best to trek there is may to September so you will have great trekking experience in upper mustang(Lo Manthang) region. You must have to join 2017 and 2018 with the trekking company company to trek in Upper mustang region. Mustang trekking is an exotic tour to unspoiled Tibetan villages on the other side of Nepalese Himalaya bordering with Tibet. 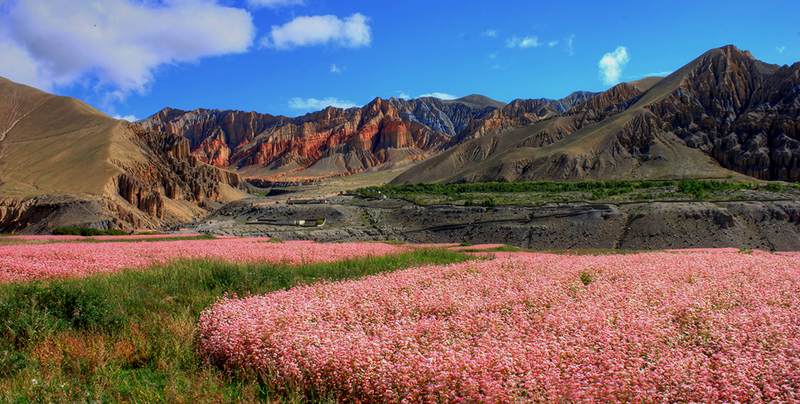 The main highlights of Mustang trekking are antique Tibetan villages, rare medieval Buddhist arts, the exotic culture and the unique beauty of the Himalayan desert. The medieval settlement of Upper Mustang and its capital Lo Manthang lie in the remote Himalayan desert behind the Dhaulagiri and Annapurna mountains. Foreigners were not allowed to enter Upper Mustang until 1992. Upper Mustang is not much in contact with rest of Nepal, and keeps an aura of a remote, mysterious and unusual land, which is one of the unique charms of the Mustang trekking. Geographically the land is an extension of the Tibetan plateau, characterized by windy and dry valleys, eroded canyons and unique stratified rock formations .The people in Upper Mustang are of Tibetan origin, migrated from Tibet centuries ago, and belong to Bhatia’s and Loba communities. They practice Sakyapa school of Tibetan Buddhism. Upper Mustang is perhaps the only place to see Tibetan culture in completely undisturbed state. The houses and monasteries in here have medieval look and unique local architecture. Mostly they are built with stone and sun baked mud bricks. People mostly grow potatoes, buckwheat and barley. It is a land covering about 2600 sq km in area and 6000 people. Day 06: Syangboche trek to Charang (Tsarang) 3650m.